So, Le Labo has done a collection for Anthropologie.1 On the surface, it makes a lot of sense. Le Labo's aesthetic, shown in its heavy bottles mimicking apothecary jars and labeled with a font reminiscent of an old typewriter, dovetails nicely with Anthropologie's tidy-bohemian image. A bottle of Le Labo Iris 39 would be right at home on a bureau adorned with Anthropologie's "antique" drawer knobs. Plus, a high-end designer working with a mall-type store can be a raging success. Look at all the fashion designers who put together sell-out collections for H&M. But in the case of Le Labo's venture with Anthropologie, I have to wonder if Le Labo merely phoned this one in. Even the line's packaging is a little shoddy. Sniffing my way through the Le Labo + Anthropologie collection, I miss Le Labo's usual offbeat take on a fragrance. Sure, Bouquet Blanc is a heady white floral, but so are a dozen others — most notably Frédéric Malle Carnal Flower. Poudre d'Orient is an easy and warm powdery amber, but I'd recommend Kenzo Flower Oriental instead. Orange Discrète? A pretty orange more aldehydic than juicy. Go get Fendi Theorama. Chant de Bois? A fine wood in the two-by-four mold, but not so fine or interesting as too many others to list. Belle du Soir, on the other hand, is the one Le Labo + Anthropologie fragrance that hints at the who-cares-what-you-think attitude I love from Le Labo. According to the Anthropologie website, Belle du Soir is a "spicy" fragrance that is "musky and rich" with notes of neroli, water lily, gardenia, cedar, sandalwood, and patchouli. I wouldn't have guessed any of that. On my skin, Belle du Soir kicks off with an aggressive, dry citrus, almost like a woody aftershave. Nothing soir-ish about it. I was ready to write it off the first time I dabbed from my sample vial. But as the fragrance settled over the next 20 minutes, it became more silky and elegant and started to smell an awful lot like a woody floral chypre. In fact, it reminded me of Madame Rochas. Suddenly the name, Belle du Soir, began to make sense. This Belle isn't lush and heavy as you might expect a "spicy" fragrance with gardenia and patchouli named after "evening" might be. Instead, it's wispy, more like moonlight and dusty, forgotten corners than like a hot and heavy summer night. Belle du Soir's floral heart is subdued and wrapped in cedar and sandalwood thin as tissue paper. Whatever patchouli is there isn't noticeable on its own. Its lightness isn't girlish, but is musty, like the smell of an old book, and balanced with occasional hints of stemmy green (the gardenia?) and sweet sandalwood. Maybe most of the Le Labo + Anthropologie fragrances aren't supposed to be masterpieces, but rather are gateway fragrances for the uninitiated. They are easy to like and convenient to buy, just like Anthropologie's sweaters appliquéd with cashmere roses are easy to like and much more convenient to buy than the brocante finds they reference. A vintage clothing lover like me, who spends hours sorting through thrift shops for one-of-a-kind fabric and meticulous tailoring, would most likely toss an Anthropologie sweater aside at an estate sale. Similarly, a perfume lover might rather save his money for Le Labo proper. Le Labo + Anthropologie Belle du Soir comes in a 60 ml bottle of Eau de Parfum ($62), a 4.5 g solid ($28), and a 14.5 ounce candle ($32). It is available at Anthropologie. 1. Please note that the products are not being sold under the Le Labo brand name; the packaging simply says "by the creators of Le Labo". Angela: Thanks for the quick reviews. Belle de Soir sounds like something I’d like to test next time I stumble across and Anthropology store. When you do try Belle du Soir, make sure you give it a chance to settle on your skin. The first burst is kind of harsh, I think, but it mellows out nicely. Sounds like a good tip – a lot of the oldies but goodies act the same way too. So true! I have to say, though, that the oldies aren’t usually quite as assertive as this one in the beginning. Thanks for the review Angela. I love that bottle, although I am tempted to try out the solid. It appeals to my sense of old-fashionedness. Speaking of thrift stores, I am still needing to check a couple out I found not far from where I work. I will let you know if I come up with anything. I didn’t get the chance to try the solid, and I wonder if it’s a little different–whether it stays with the first, dry burst longer or goes more quickly to the drydown I like. As usual, great review! Belle de Soir is calling my name. The gardenia note scared me at first but a green gardenia doesn’t sound like the heavy sillage monster that usually scares me away. But I also think Orange Discrete might be a possibility as well. I have no doubt Theorema is better, but since it is discontinued and the little I have left I use extremely sparingly, would it be a successful Theorema alternative? Really, I think a lot of people would be hardpressed to ID the gardenia right away. If you try it, let me know what you think! I think maybe I’ll try some of these in candle form first. I’m such a Le Labo freak these days that I feel like I can guarantee I’ll be disappointed by these as perfumes. Thank you for the thoughtful review, Angela! I bet lots of the fragrances would make good candles–maybe better candles than perfumes, even. I’m really curious about the Belle du Soir candle. I tried 2 of the series on skin and found them boring, but you have me intrigued with this review I’ll need to try it on. Totally agree I’m happy they didn’t put out yet another fruitchouli. I do wear some stuff from Anthro, in the less whimscial category. In high school all of my clothes came from thrift stores. Value Village! Used to love the hunt, but found it too time consuming after a while. Maybe I need to give it another try….recently I’ve been wearing a vintage trench coat with a houndstooth print that I bought in highschool. Vintage clothes shopping definitely takes time, unless you have the money to drop at a nice boutique. Your coat sounds fabulous! I admit I haven’t been in an Anthropologie for at least a year, but I used to enjoy flipping through the catalog. It was so nicely styled. Off topic, but I have to say that Charlize Theron looks fantastic on the vertical banner ad on the home page. I have heard that J’Adore has been reformulated, I have a bottle from 1999 and its all spicy champaca and plum. I will have to find a tester to see if its changed. Can anyone confirm or deny? I understand that it’s changed, but someone else may have a different opinion. I think this winter Nordstrom has an exclusive J’Adore parfum??? And Charlize Theron is awesome all the time! They have J’Adore L’Or and it is rather scrumptious! Thanks for the review Angela, I will actually go (somewhat out of my way) to try Belle du Soir! If you saw them in a store, did you perchance try the Rather Novel Collection by Givaudan? Those were fun. Tea scents. I tried them from sample tubes, but I love the sound of the tea scents. I had no idea Anthropologie sold SIP and Ineke, too! Clearly a trip is in order. Thanks for the review! I am a little less excited by this line now (good!) but will give this one a try if I wander in to Anthropologie. I am annoyed that they make testing perfume kind of difficult – not a testing strip to be found. My local store is light on the line I am most interested in, which is DS & Durga. It really is hard to test more than two or three fragrances if you don’t have a test strip. I have some DS & Durga samples around somewhere–let me see if I have anything I can send you. I have to admit I’m unsurprised that you find these scents shoddy — for whatever reason, I’ve always found Anthropologie’s clothes to be on the cheaper end in terms of quality (in terms of price, it’s another story entirely). Of course, that won’t stop me from smelling the fragrances — especially Belle du Soir which sounds intriguing! Thanks for a great review. Reports are that the packaging is shoddy–labels peeling, set crooked, cap doesn’t fit well, etc. The fragrances are fine, but that’s it. I guess it’s especially hard when I expect anything with Le Labo’s name on it to be interesting. If you do try Belle du Soir, let me know what you think! I can’t get past the bottle. The cap would bother me forever. I haven’t given any Anthropologie fragrance collaborations a second look since being heavily disappointed with the DS Durga releases. Great review! 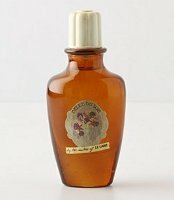 I bought a bottle of Belle du Soir because it reminded me of Aveda’s old Eros perfume, which has been discontinued. I’m really enjoying it so far. Will have to “graduate” to the real Le Labo one of these days. The Le Labos are a lot harder to find than the Anthropologie versions–but they really are so much nicer, I think.